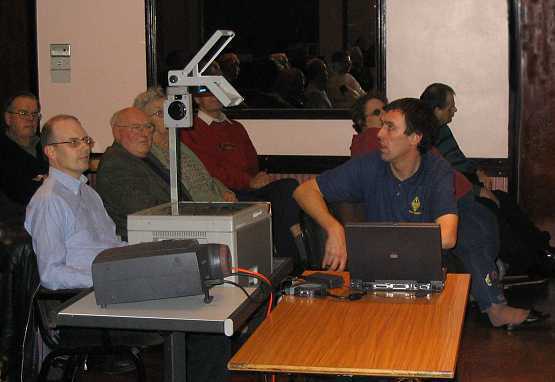 Nigel, G6ZVV (V V) and Stuart, G7KSQ visited Beehive Lane for the final meeting of the year to refresh memories of the Radio Amateur Emergency Network (RAYNET). Why have RAYNET?. RAYNET was originally formed in 1951 but was not taken seriously by the authorities. We were reminded that we have just witnessed the 50th year anniversary of the severe storm which swept into East Anglia & Essex in January & February 1953. Oxenham Farm, Great Wakering owned by Frank & Eva Threadgold who feature in the picture in 1953. Now owned (April 2005) by John & Neil Treadgold. Details supplied by Sarah Aldridge - thanks - April 2005. The subsequent Waverley Enquiry found that the sea defences & early warning schemes were a mockery. It accepted that many had died simply because they were not warned to take shelter or evacuate. 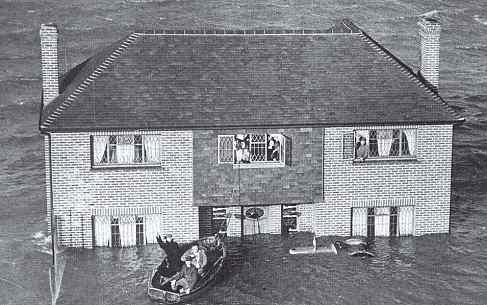 The first most people knew was when the water had surrounded the house. RAYNET was now formally established and has responded to a number of emergencies. The centre of the display area. From left to right. Carl, G3PEM; Trevor, M5AKA; Ken, G3PMW; Ela, G6HKM; Eric, G8ADX; Julie; Nigel seated infront of his portable computer which drives the projector & Brian, G4CTS. Nigel drove the computer projector while Stuart did the presentation. We were told of some of the many events RAYNET had attended but were pleased to hear that fortunately we had not seen the severe weather of yesteryear. To provide "on site training" RAYNET cooperates with local Societies & events such as those involving the Scouts and the Danbury Firework Display in November. After an interesting question & answer session, Stuart invited anyone to join RAYNET and gave out some application forms. Thank you Nigel & Stuart for an interesting presentation. Members were provided with shortbread & chocolates as they took the refreshment break. Stuart drew the Raffle where many good prizes were eagerly snapped up with the last ticket being chosen by Luke, a young SWL. RadCom Editor, Steve Telenius-Lowe, G4JVG visited CARS and was delighted to see the large audience. One side of the Marconi Social Club's meeting room. Screen shot projected from Chris, G0IPU's computer projector of Steve's slide. 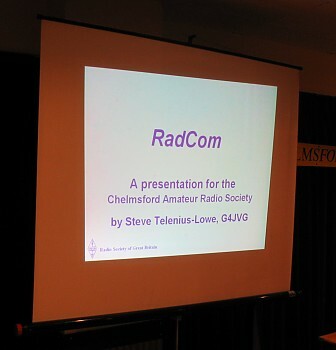 Steve went on to describe how RadCom is put together and some of the problems encountered. After his presentation he answered questions and received some constructive suggestions for improvement. A very interesting presentation - thank you Steve & the RSGB. RadCom Editor Steve & Trevor, M5AKA taken during the break. 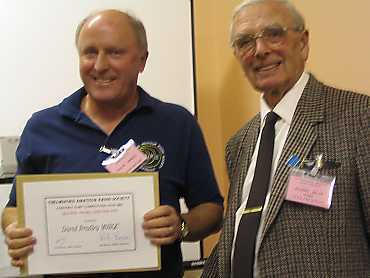 Award number 21 for CW & 22 for SSB. Murray lecturing on the recent trip Chris, G0IPU, Carl, G3PEM & he took to the RSGB "Train the Trainers" seminar. 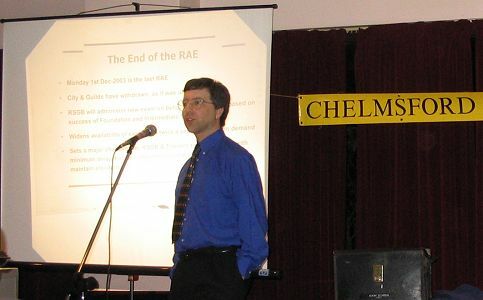 He also informed the audience of the proposed changes to the Licences which will come into effect on January 1st, 2004. If you would like to see Murray's Slides in PDF Format, click below. They are only 22kBytes so should download quickly. Click BACK to return to this page. Click Here to see Murray's 7 Slides. Colin, G0TRM is the CARS Sound Engineer. Here he is looking at changing the tape during the presentation by Steve, G4JVG. Note the Receive unit for the dual diversity Radio Micrphone, Audio Power Amplifier & driver unit for the Radio Loudspeakers. Thanks Colin you do a great job. 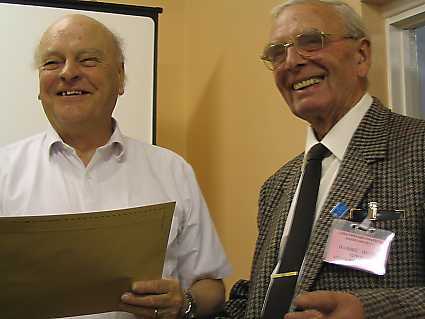 John, G8DET opened the evening in the Board Room and after announcements called on Carl, G3PEM to present the Amateur of the Year Award to Trevor for his work with Publicity. 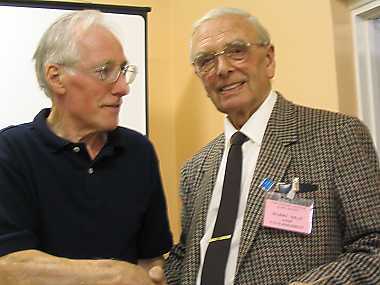 Harry presenting Trevor with Amateur of the year Award. Trevor has ensured that the world of the Amateur Radio fraternety knows about CARS. 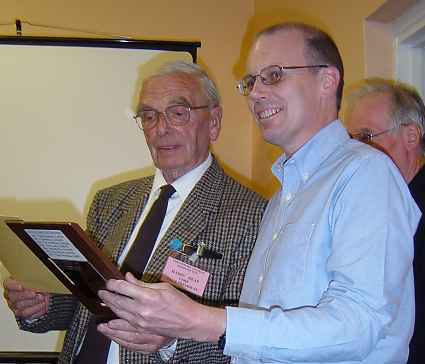 Ron, M3CAM being presented with the CW Chelmsford Award by Carl, G3PEM. This & all further photographs taken by Martyn, M3VAM. Then the certificates for the Contructors Competition were awarded. Anthony, M1FDE being presented with the Roy Martyr Award & Constructors Certificate by Ela, G6HKM. The AGM followed with Chairman's, Secretary's, Membership & Treasurer' reports's being read and accepted. 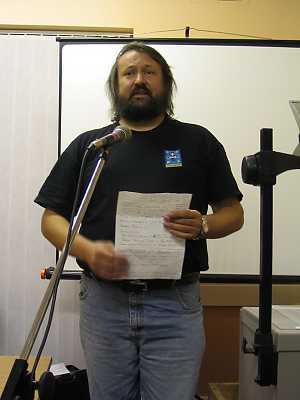 Chris, G0IPU presenting the Foundation Report. CARS has been in the forefront of presenting Foundation & Intermediate teaching programmes. See the Links Page for copies to download. John then stood down the old Committee, President Harry, G5HF then suggested that assuming noone else wanted the Chaiman's job that he should be elected again. The new Committee were then voted in. 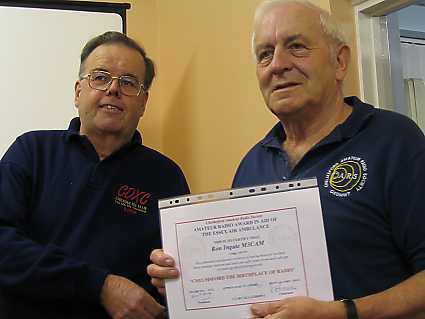 A glass plaque & certificate was presented to David, M0BQC to record his services as Secretary. 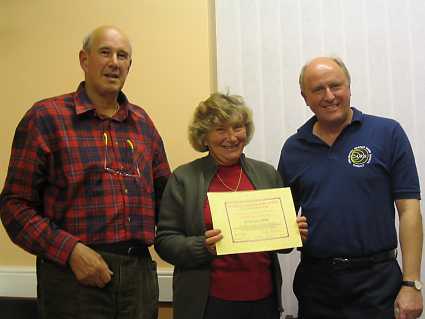 John, G8DET (left) with David, M0BQC & his Wife, Jill with his Certificate. 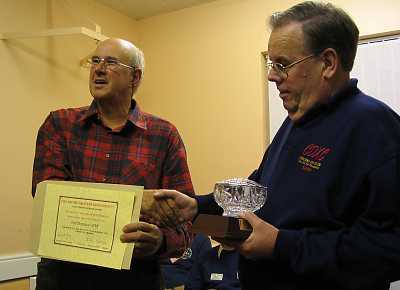 John presenting Carl, G3PEM with his glass rose bowl as Vice Chairman for a number of years. George, G3UTC & Jean provided the Raffle which was drawn after the break. 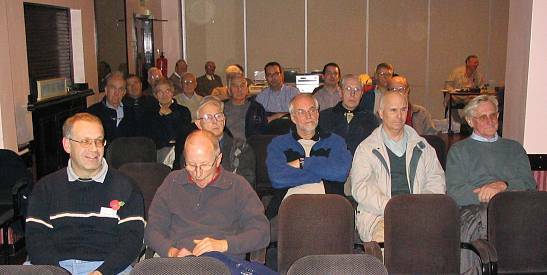 Then a Forum consisting of Murray, G6JYB, Fred, G2HFN & Tony, G4YTG answered questions from the floor. The top table for the Forum. Left to Right. Murray, G6JYB, Fred, G2HNF & Tony, G4YTG. Photograph by Trevor, M5AKA. The main topic being - how do you put up a full size G5RV aerial when your garden is too small?. b) provide a loading coil in the centre of each of the two arms. These are available from W&S. d) tieing the two feeder wires together and load up as per normal. A good evening was had. Thanks to the Committee. 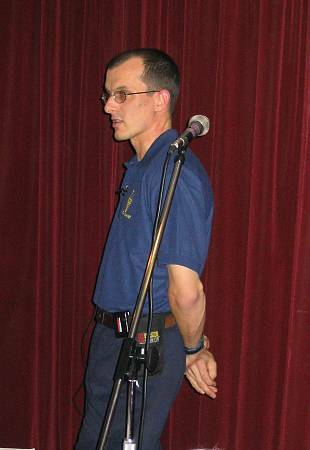 Paul travelled via the M25 to present another absorbing evening - this time on Simple Antennas. 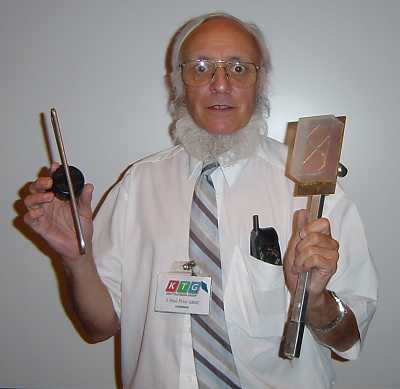 The emphasis on antennas for the 1.2 GHz and 2.4 GHz Amateur Television bands, however, all the designs he showed scale quite easily to the other amateur bands. Paul started by going over the basic antennas types; isotropics, dipoles and ground-planes. Paul holding a 70cm dipole in his right hand & a Double D in his left. A balloon was put to good effect to illustrate the different types of radiation pattern that each antenna produced. Although ground planes are quite popular they can have a high angle of radiation but Paul showed this can be reduced by sloping the ground plane elements downwards. Paul then went on to cover Yagi antennas. With these high gains can be achieved in one direction by simply adding more director elements although after about 15 directors you start hitting the law of diminishing returns where doubling the length starts giving far less than 3db extra gain. A solution to this is to stack the Yagis to give more gain. 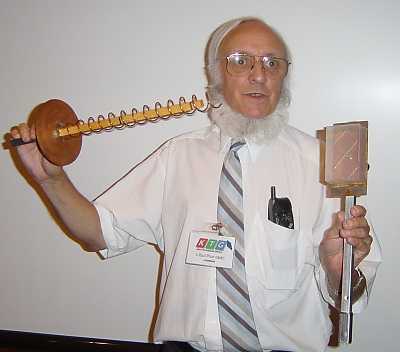 Paul showed us an omni directional antenna which used the principal of stacking to give high gain all round coverage. This antenna comprised 35 stacked dipoles which gave an impressive 20db of gain. Paul holding a 13cm Helix in his right hand & a Double D in his left. Thank you Paul for another interesting evening. 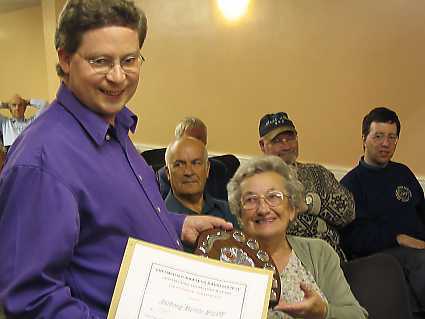 August Meeting - The Tabletop Sale by Colin, G0TRM. Another August, and another Club Tabletop Sale has come and gone, this last one, was possibly the most successful we have yet held. Over 80 people were known to have attended as members, vendors and visitors. Our well known visitor Zippy, G4ZPE was again much in evidence and with help from Simon, he had many happy customers at their table vying for all sorts of goodies from the depths of the Waters and Stanton store. 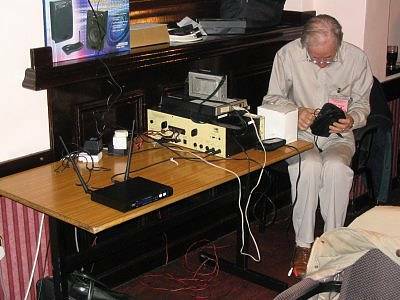 Particular thanks to them for the super prize they gave to the Club Raffle, the QRP SSB transceiver kit attracted many hopeful punters and it helped to make the Raffle a great success, organised by Tony, G4YTG. We had sellers from afar a field as Chingford in one direction and Bexley, Kent in another, we hope they will come again another year and join in the very friendly and social evening. Thanks to all the Club Members who came along to sell, to buy or just to have a look and to exchange views with others. Thanks of course to the Stewards and others who played their part in helping to make it a very successful evening. UI-View is a packet based APRS - Amateur Positioning Reporting System OR Automatic Packet Reporting System using a PC, a TNC and a radio. It gives visual indication of each user's position in the world via digipeating. It is used in the amateur context mainly for direct messaging via the digipeaters. After the refreshment break, Murray, G6JYB and Chris, G0IPU presented the latest information regarding Foundation, Intermediate and Licence conditions. CARS are running these courses at Danbury at the present time. 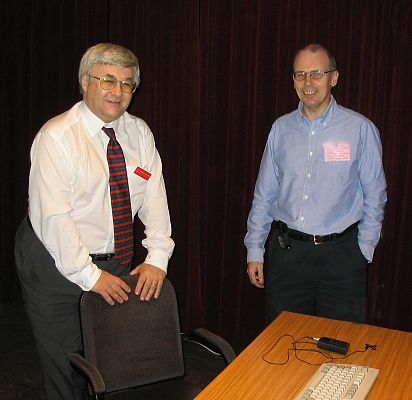 Murray & Chris's Slides in Adobe Reader PDF format - only 10kbytes.